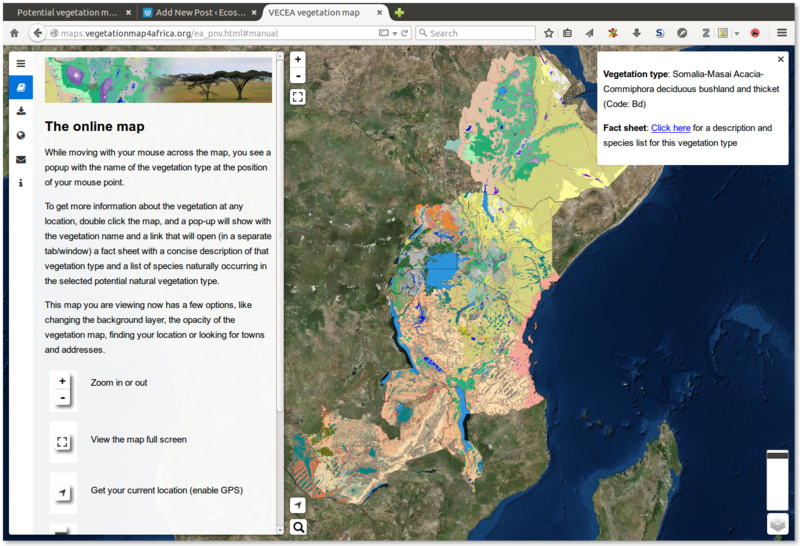 Check out the new vegetation map and accompanying tools for identifying and selecting the right tree for the right place in eastern Africa at http://vegetationmap4africa.org. The potential natural vegetation (PNV) map of eastern and southern Africa covers the countries Burundi, Ethiopia, Kenya, Uganda, Rwanda, Tanzania, and Zambia. The first version of the map was developed by various partners in East Africa and Europe in 2010 and has now reached version 2. Just got an article out in PlosOne. Analysis were carried out and maps and figures created using a stack of open source tools, including GRASS GIS, R, and QGIS. The article addresses the question whether protected areas in Eastern Africa are representative of the diverse range of species and habitats found in the region and whether they protect those areas where biodiversity is threatened most? The paper uses a recently developed high-resolution potential natural vegetation (PNV) map for eastern Africa as a baseline to more effectively identify conservation priorities. It examines how well different potential natural vegetations (PNVs) are represented in the protected area (PA) network of eastern Africa and used a multivariate environmental similarity index to evaluate biases in PA versus PNV coverage. In addition, levels of threat to different PNVs are assessed. Results indicate substantial differences in the conservation status of PNVs and particular PNVs in which biodiversity protection and ecological functions are at risk due to human influences are revealed. The data and approach presented here provide a step forward in developing more transparent and better informed translation from global priorities to regional or national implementation in eastern Africa, and are valid for other geographic regions. In an earlier post I wrote how I created a mash-up map with MapTiler. There is an option in MapTiler to set transparency for a color, but this didn’t work for me at the time. I therefore created a small script to convert the background color to transparent and to process all PNG tiles generated by MapTiler using the PNGNQ utility.